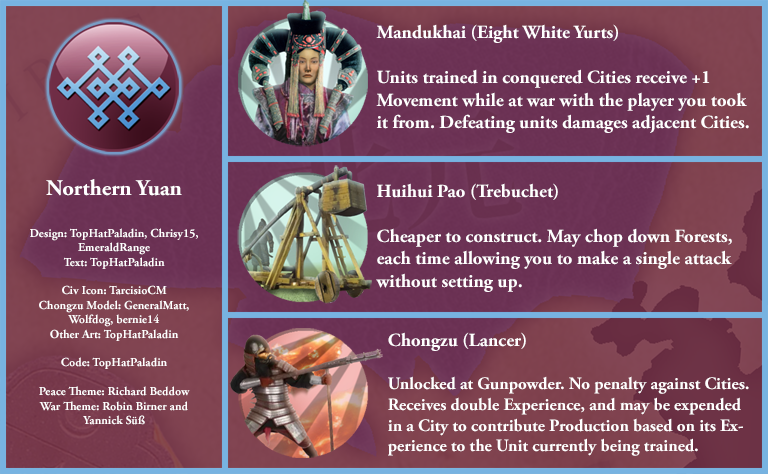 Adds the Northern Yuan dynasty, led by Mandukhai Khatun, to Civilization V as a custom civilization. Requires Brave New World. [BNW Requires] Adds the Chamorro, led by Matå'pang, to the game as a custom civilization. [BNW Required] Adds the Holy Roman Empire's Ottonian dynasty to the game as a custom civilization. [BNW Required] Adds Namibia, led by Jacob Morenga, to the game as a custom civilization. [BNW Required] Adds the Ket people, led by Olgit, to the game. [BNW Required] Adds the Anangu, led by Tjilpi, to the game. [BNW Required] Adds the Tang Dynasty of China, led by Taizong, to the game. (BNW Required) Adds the Purépecha, led by Tariácuri, to the game. [BNW] Adds the Rashtrakuta Empire, led by Amoghavarsha I, to the game. [BNW Required] Adds France, led by Louis XI, to the game. [BNW Required] Adds the Pala Empire, led by Dharmapala, to the game.